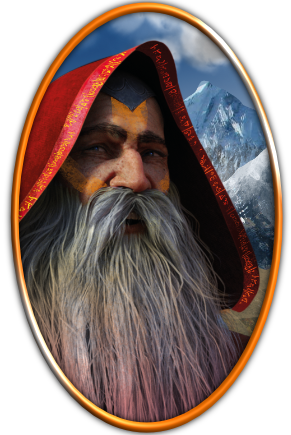 Wise and noble, the Wizard is one with the land and the elements that shape it. His knowledge of the Elementals and their guile will protect him. 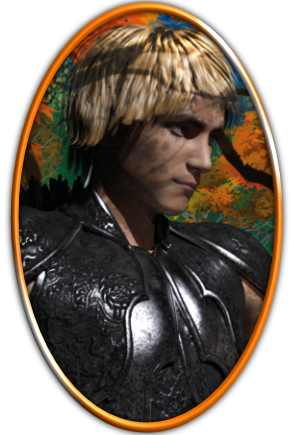 His knowledge of herb and root will nourish him in his quest to best the very gods themselves and become a hero of the Immortal Paths. Brave and steadfast, the Knight will hold his ground and push on through any challenge that he faces. His honour and courage will take deep into the mouth of danger and death, leading him through to the other side. His mind is set on the path to becoming a champion of the Immortal Paths. 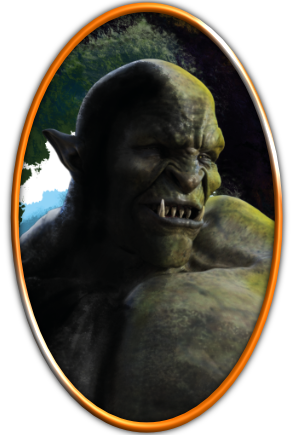 Of good nature, the Orc, often misunderstood, is a power house of raw strength. The mountains are in his blood. Harsh winds and numbing cold are his clothes. Fire, water nor earth will stand in his way to become a champion of the Immortal Paths. A formidable warrior, the Elf, whose prowess in path-finding is as unrivaled as her beauty. She will endure any hardship and survive with only her wits and knowledge of land and animal. A huntress. A warrior. A true hero. Falling like an endless stream of tears, a great river crashes down from the broken towering edifice of the Ancient Aqueduct, as though it were mourning for the long dead civilisation who, in their arrogance, thought they were so mighty that they could shape the world to their bidding. The Elementals were swift to correct them of that mistake. 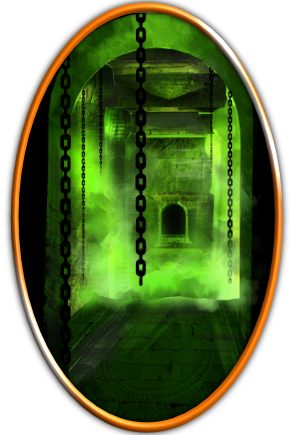 Deep, and dark within the long-forgotten depths of the once great fortress palace of kings long past, the Poisoned Dungeon remains a deadly crossing for any hero. Its spectral glow of green will ensnare and intoxicate all who linger. The long dead cult of two Elemental gods built this temple to fire and water deep within the black rock far below. 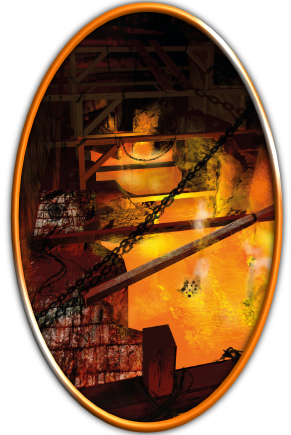 Taming both a mighty underground river and fiery lava flow, the zealots were consumed by the wrath of their own gods that they devoted themselves to. Greed brought many to plunder the world for its riches. Many sacrificed much to venture far beneath the foundations of the world to find countless riches. The molten rivers of gold flow untouched since those who sought such wealth died in petty squabbles. 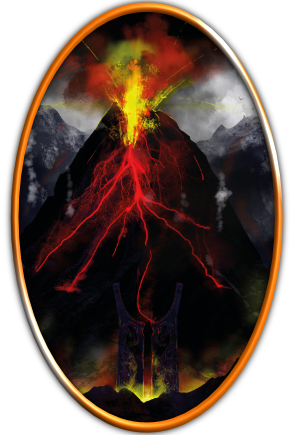 A black foreboding and smouldering giant, the Volcano rarely sleeps in its rage. 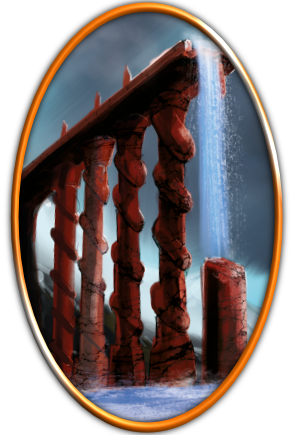 The inhabitants of this region, a mysterious and reclusive tribe, built temples in vain to placate their god. The larva consumes only but the narrowest of crossings to allow heroes to pass. 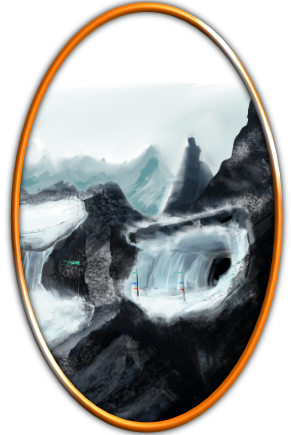 Lonely and wrapped in bitterly cold winds the Ice Cave Pass is treacherous to the most expert mountain rangers. Only a few defiant prayer flags mark where there was once a narrow crossing for merchants. 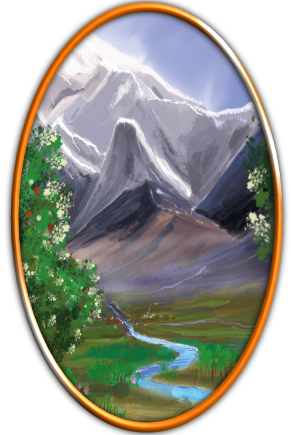 Heroes, weary from their quest to win the Immortal Paths take their time to cross the gentle slopes of lush green hillside set against the majestic snow-capped mountain peaks. 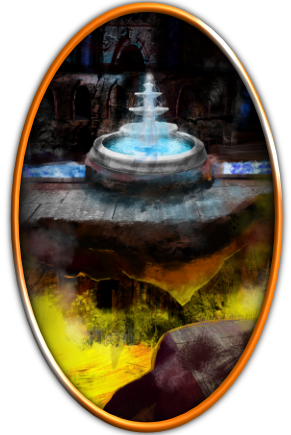 This is but a brief chance of rest before continuing on with the ancient challenge of the Elementals. You can purchase your copy of Immortal Paths online from our secure online store. Pay with credit card or PayPal. We ship free to the UK and mainland Europe until January 2018. Welcome to the Immortal Paths! If you have found this page you a probably our first set of owners of Immortal Paths. Welcome to you! If you have scanned the QR code on the box, welcome! You can download the rules below or watch the How to Play video to the right. This video can also be downloaded to your own device. Each hero must make their way across nine obstacle challenges of fire, earth and water. 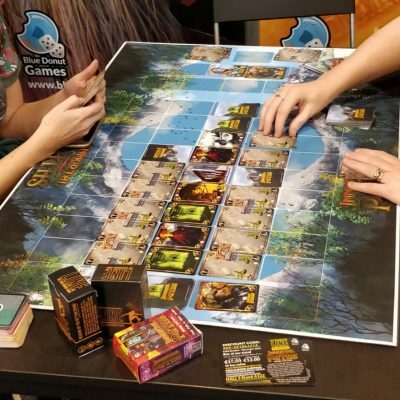 Summon bridges of stone, wood or rope to build the longest possible connected paths that create powerful point multipliers and gain you the highest score to win. Watch your challengers – choose your bridge summoning cards wisely. Seek your advantage at every turn! Choose poorly and you will join those who fell in peril. The highest score will crown the next champion of the Immortal Paths! 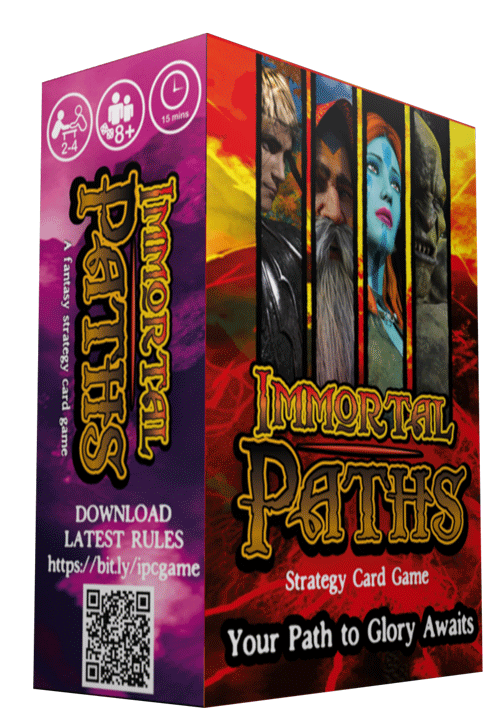 Immortal Paths is a game for up to 4 players, aged 8 and over. A game for 2 players takes about 15-20 minutes. A 4 player game will take about 30-40 minutes. Watch the ‘How to Play’ video to get started quickly with Immortal Paths Strategy Card Game. 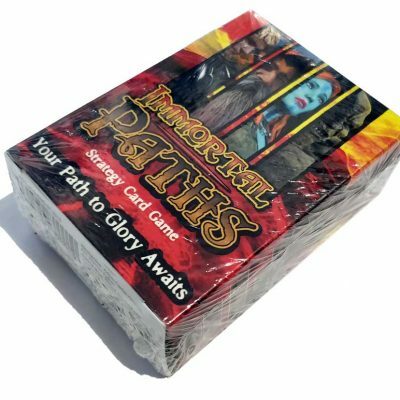 Buy Immortal Paths online from our secure store. Free shipping to UK and mainland Europe until January 2018.